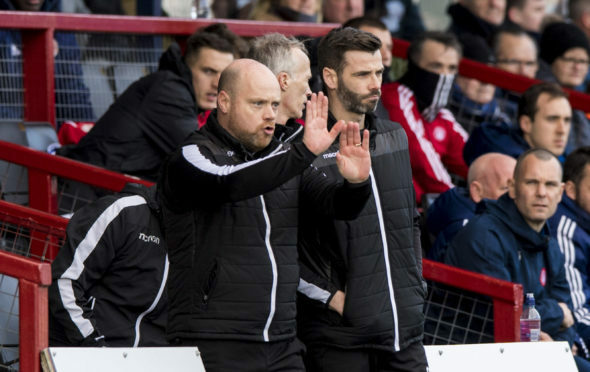 Former Staggies under-20 coach Smith walked out on the League 1 side on Tuesday following reports of a breakdown in the relationship between the manager and his board at Stark’s Park. Kevin Cuthbert has been placed in charge on a caretaker basis for the trip to Dingwall tomorrow but having dealt with a similar situation in their last game Ferguson says the County players will have no problem in maintaining their focus on the task at hand tomorrow. He said: “It doesn’t change things for us. We faced the same issue last week before the Falkirk match. “Everyone talks about this bounce and it maybe makes our preparation slightly different from what it would have been, but we’re a firm believer in getting right what we’re doing. While County are focusing on booking their place in the third round Ferguson is sad to see Smith leave Raith. The former Rovers boss and the County co-manager were colleagues at Victoria Park when they worked together in the youth academy but Ferguson has been in the game long enough to ensure little surprises him in the game anymore. The Staggies co-manager said: “It’s a strange one. I know Barry well from his time up here when he took our under 20s squad. I don’t know the ins and outs of it. “Certainly from the outside looking in, he was unlucky in his campaign last year, where he was pipped to automatic promotion. With a near full-strength squad to choose from tor tomorrow’s cup-tie Ferguson and co-manager Stuart Kettlewell are considering making changes for the visit of the lower-league club but Ferguson insists the expectation level will not change regardless of who is picked for the game. He said: “We’re still throwing things about. There’s an argument for both (changing the team and keeping it the same). Obviously we believe we have a good group of players who all want to play, so we have a decision to make. Marcus Fraser is the only absentee after suffering a calf injury in the Betfred Cup loss at Hibernian last month but Ferguson is hopeful the defender will return for next week’s Championship match at Queen of the South.